What are the vitamin D requirements? What are vitamin D deficiency symptoms and signs? What are health risks of vitamin D deficiency? How do health care professionals diagnose a vitamin D deficiency? What is the treatment for a vitamin D deficiency? Is it possible to prevent vitamin D deficiency? 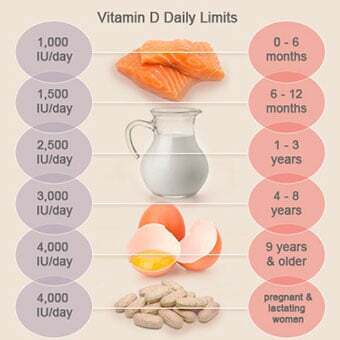 What are symptoms and signs of an excessive vitamin D intake (Daily Limits Chart)? The "sunshine" vitamin is a hot topic. You may have recently found out that you are deficient or know someone who is. It's shocking for most people when they have never had a problem before and believe nothing has changed to make it a problem now. The truth is that a lot has changed, and vitamin D deficiency and insufficiency is now a global public health problem affecting an estimated 1 billion people worldwide. Vitamins are considered essential nutrients because either your body cannot make them or they are made in inadequate amounts to prevent negative health consequences or diseases. So it's essential that you provide vitamins for your body by food and/or supplements. Vitamin D was discovered to be essential when it was found to be needed for the treatment of rickets. Vitamin D is one of the four fat-soluble vitamins (A, D, E, and K). There are two forms of vitamin D: D2 and D3. Vitamin D2, also known as ergocalciferol, comes from fortified foods, plant foods, and supplements. Vitamin D3, also known as cholecalciferol, comes from fortified foods, animal foods (fatty fish, cod liver oil, eggs, and liver), supplements, and can be made internally when your skin is exposed to ultraviolet (UV) radiation from the sun. Structurally, these two are not the same. Many believe that vitamin D should be classified as a hormone, with some calling it the forgotten neurosteroid. The health consequences of being deficient go far beyond rickets and what occurs with any other vitamin. And unlike other vitamins, it can be made by your body when exposed to sun and the active form in your body, called calcitrol, has similarities to other hormones (estrogen, cortisol, and testosterone). The real dangers of excess exposure to the sun and skin cancer have been greatly publicized and resulted in people covering up and using sunscreen when in the sun. We have also had a shift in spending less time outdoors because of increased work hours and more sedentary lives. As a result, vitamin D levels began dropping without most health care professionals realizing it. Researchers have been focusing on the consequences of vitamin D deficiency and have found an alarming number of health issues outside of its role with rickets. These include skeletal diseases like osteoporosis, certain cancers, cardiovascular disease, autoimmune diseases, infections, inflammatory bowel diseases, psychological disorders, cognitive disorders, obesity, and or mortality. Correcting vitamin D deficiency is not as simple as taking a pill or getting more sun. 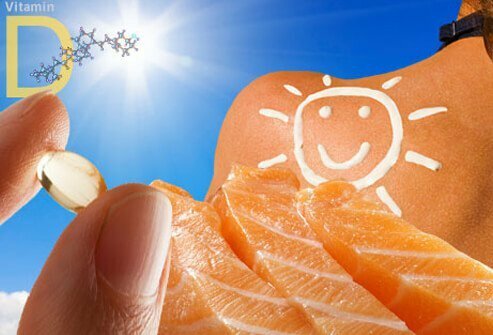 This article will teach you all that you need to know about the benefits of achieving and maintaining optimal vitamin D levels and how you can do it. Yes, deficiency of vitamin D can cause bone pain and muscle weakness. However, mild vitamin D deficiency is not necessarily associated with any symptoms. Vitamin D has been referred to as the "sunlight vitamin" because it is made in our skin when we are exposed to sunlight. These amounts are based on what is needed to maintain the blood levels that each guideline committee has established as ideal. The higher the blood level that you need to maintain, the more vitamin D you will need to maintain that level. If your blood level is deficient, these are not the guidelines for you to follow. You will first need to get your levels up by taking vitamin D above these amounts and then you will follow these levels once you have reached your adequate level. Your health care provider can provide recommendations for a safe way to do this. By the turn of the 20th century, 90% of the children living in New York, Boston, and Leyden in the Netherlands were afflicted with rickets, a bone-deforming disease. The first observation of this disease was in the mid-1600s by Whistler and Glissen, who reported that children living in industrialized cities in Great Britain had short stature and deformities of the skeleton, especially of the lower legs. It wasn't until 1889 that the discovery that "sunbathing" was important for preventing rickets came about. 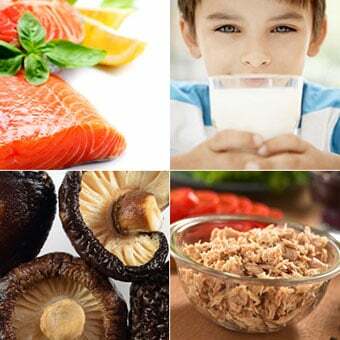 Type 1 diabetes (T1DM): Research has shown that children with type 1 diabetes have a higher chance of having a vitamin D deficiency compared with the general population. 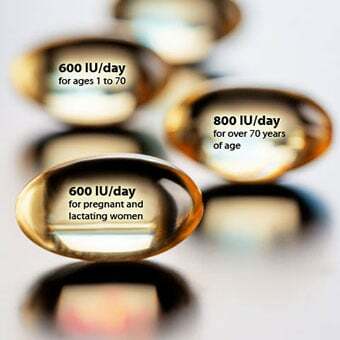 In Finland, the recommendation for daily vitamin D supplementation was gradually reduced from 4,000-5,000 IU/day in 1964 to 400 IU/day in 1992. During this period, T1DM increased by 350% in those 1-4 years of age, 100% in those 5-9 years of age, and 50% in those 10-14 years of age. In 2006, authorities required that all dietary milk be fortified with vitamin D2, and the incidence of T1DM plateaued and began to decrease. Multiple sclerosis (MS): Current evidence supports that vitamin D deficiency increases the risk of developing MS and alters the disease activity in people with MS. Numerous studies have linked the occurrence of MS with birth month. There is also a higher prevalence of MS in geographic areas farther from the equator, where people are exposed to less sunlight. The lack of sunlight exposure appears to be a significant predictor, and research is ongoing in this area. A large review of studies shows that with adequate vitamin D levels in people with MS there are fewer relapses, lower risk of development of new lesions in the brain, less disability and disease severity, and better nonverbal long-term memory performance. Studies now need to be done to confirm if this is directly due to vitamin D levels. Lupus: People with lupus are often photosensitive, causing rashes and possible disease flares when exposed to sunlight. The resulting lack of exposure to sunlight puts them at high risk for vitamin D deficiency. Evidence has shown that a deficiency can affect disease activity and damage along with contributing to the morbidity and mortality in people with systemic lupus erythematosus (SLE). Rheumatoid arthritis (RA): A review of research found that people with the highest vitamin D levels had a 24.2% lower risk of developing RA compared to those with the lowest levels. They also found that there was a higher rate of vitamin D deficiency among people with RA than with the general population, and the activity of RA got worse as the level decreased. Autoimmune thyroid disease (AITD) (Graves' disease and Hashimoto thyroiditis): In a review of 20 studies, they found that AITD patients has lower levels and were more likely to have vitamin D deficiency compared with controls. In a review of 26 studies of Graves' disease, they concluded that low vitamin D status may increase the risk of Graves' disease. The link between the sun and cancer is typically not seen as a positive one because of the connection with skin cancer. UV-B radiation from the sun is said to be the most important environmental risk factor for nonmelanoma skin cancer. Because the sun is the primary source of vitamin D, researchers are looking to see what role it plays in skin cancer. Some believe that enough sun exposure to keep your vitamin D levels up, while protecting your skin from damage, is beneficial to skin cancer survival. There has also been research to show the protective effect that vitamin D has with the development of other cancers, including colon, breast, and prostate cancer. In 1941, U.S. pathologist Frank Apperly published geographic data that demonstrated for the first time an inverse correlation between levels of UV-B radiation in North America and mortality rates from cancers. This study suggested that more exposure to UV-B radiation led to fewer deaths from cancers. Since this was published, other studies have suggested that there may be an association between an increased risk of dying of various malignancies (for example, colon, breast, ovarian, melanoma, and prostate cancer) and living far from the equator. The anti-inflammatory properties of vitamin D may also be able to assist with lowering pain levels in cancer patients when deficiencies are corrected. It's been shown that vitamin D plays a crucial role in brain development, brain function regulation, and a healthy nervous system. Vitamin D deficiency has been found to be common in patients with Parkinson's disease, Alzheimer's disease, schizophrenia, depression, anxiety disorders, dementia, and older adults with cognitive decline. A meta-analysis reported a 2.4-times greater risk of cognitive impairment in people with low vitamin D levels versus those with adequate levels. It's been suggested that maintaining adequate levels of vitamin D levels throughout life may help to prevent age-related neurological disorders. A summit with the leading experts, including physicians and scientists, from across the world convened in 2013 to review the research in this area and to come up with clear guidelines for the medical and scientific communities. There was a unanimous agreement that low vitamin D levels and/or the insufficient utilization of vitamin D can be considered a risk factor for cognitive decline and dementia in general and supplementation was needed to correct these levels. 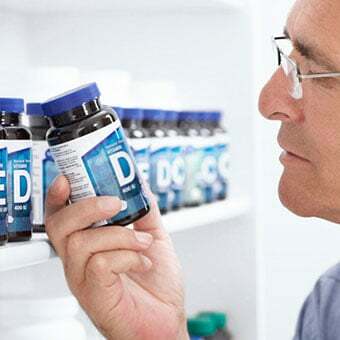 A review of vitamin D levels in 170 women, 65-77 years of age, over 10 years found that adequate vitamin D levels may be protective against declines in cognitive flexibility and psychomotor speed components of executive function. The association between lack of sunlight and depressive disorders was first noted 2,000 years ago. There are numerous studies showing low levels of vitamin D are associated with major depression and the symptoms of depression. In a study of over 6,000 people over the age of 50, those with lower vitamin D levels reported more depressive symptoms (for example, felt sad, felt lonely, couldn't get going). Those with the lowest vitamin D levels reported the greatest degree of depressive symptoms. Only small-scale studies have shown success in improving these symptoms by correcting the deficiency. Much more research is needed in this area to find out how best to treat it. Vitamin D deficiency is associated with an increases in hypertension (high blood pressure), hyperlipidemia, peripheral vascular disease, coronary artery disease, myocardial infarction, heart failure, and stroke. The anti-inflammatory effects of vitamin D may be the reason for this, and studies are ongoing to examine this relationship. A review of six studies that included over 6,400 people found that patients with peripheral arterial disease (PAD) had lower levels of vitamin D and that vitamin D insufficiency may contribute to the development of more advanced PAD. Further research needs to be done to confirm the cause and effect. It's possible that maintaining adequate vitamin D levels could lessen the length and severity of upper respiratory infections and possibly even prevent them from occurring in some people. A review of 12 studies, including 2,279 children, found that children with lower respiratory infections (LRTI) had significantly lower vitamin D levels compared with controls. There was also a relationship between the how low the level went and the incidence and severity of LRTI. The role of vitamin D in reducing the risk of hospital-acquired infections, such as pneumonia, bacteremia, urinary tract infections, and surgical site infections is also being investigated. Many of the health benefits associated with vitamin D may come from its role in decreasing inflammation. Research has shown a decrease in levels of C-reactive protein, a marker of inflammation, with increased levels of vitamin D.
When there is an inability to properly absorb nutrients in the GI tract, there is a higher risk for nutritional deficiencies. Vitamin D's role goes beyond this in that the level of deficiency may impact the severity of IBD, and maintaining adequate levels may keep you in remission longer. There has even been evidence showing larger numbers of cases of IBD in northern latitudes suggesting it has a role in prevention, as well. A study including over 500 adults found that vitamin D deficiency was linked to greater fat mass, but only in those with elevated parathyroid hormone (PTH), suggesting the cause may lie in controlling that level. Vitamin D enhances the absorption of dietary calcium by 30%-40% and phosphorus by 80%. Without it, only 10%-15% of calcium and 60% of phosphorus is absorbed. 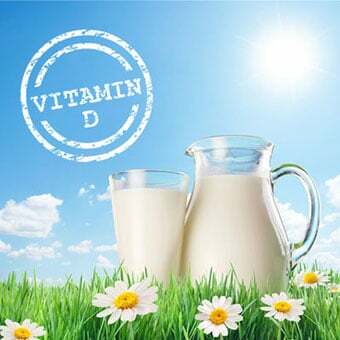 Vitamin D promotes calcium absorption in the gut and maintains blood calcium levels to enable normal mineralization of bone and prevent abnormally low blood calcium levels that can then lead to tetany. Vitamin D insufficiency leads to secondary hyperparathyroidism that causes increased bone loss, osteopenia, osteomalacia, osteoporosis, and increased fracture risk. Furthermore, moderate elevations of parathyroid hormones (PTH) may promote insulin resistance, weight gain, hypertension (high blood pressure), and left ventricular hypertrophy. Fall prevention is a public health goal for the elderly. Each year, one in three people 65 years and older experiences at least one fall, with 5.6% resulting in a fracture, and vitamin D can play a role in preventing this. There are vitamin D receptors in human muscle that have a direct effect on muscle strength. A severe vitamin D deficiency can cause myopathy, which can cause muscle weakness and pain. 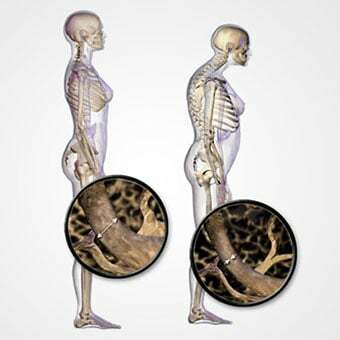 Vitamin D supplementation can reverse this and improve balance. Supplementing 700-1,000 IU/day of vitamin D3 has been shown to possibly reduce falls by 19%-26%. Vitamin D3 at a dosage of greater than 800 IU/day given with calcium has been shown to reduce the risk of fractures by 10%-15%. Another advantage to correcting a vitamin D deficiency has been seen in decreasing knee and hip pain. A longitudinal population-based cohort study of 769 randomly selected older adults aged 50-80 years found that moderate vitamin D deficiency predicts the incidence or worsening of knee pain over five years and possibly hip pain over 2.4 years. Research has shown that those with blood vitamin D levels over 25 ng/mL had a 43% reduced risk of developing type 2 diabetes compared with those with levels under 14 ng/mL. Adequate vitamin D levels have been associated with improved blood sugar levels and decreased insulin resistance in some studies. Adequate vitamin D levels have also been linked with improvements in kidney function, erectile dysfunction, sleep apnea, diabetic retinopathy, and decreased manic episodes in bipolar patients. There is ongoing research to determine links with vitamin D deficiency and the increase in the prevalence of asthma and allergies, autism, preterm birth, gestational diabetes, and preeclampsia. A deficiency in vitamin D can result from inadequate exposure to sunlight, inefficient production in the skin, not enough vitamin D in your diet, and health conditions that can affect it including, gastrointestinal disorders, renal diseases, and liver diseases. Melanin is what gives skin its color. Light-skinned people have less melanin than those with darker skin. Melanin is able to absorb UV-B radiation from the sun and reduce the skin's capacity to produce vitamin D3 by 95%-99%. Dark-skinned individuals have natural sun protection and require at least three to five times longer exposures to make the same amount of vitamin D as a person with a white skin tone. African-Americans have a population mean serum 25(OH)D level of 16 ng/mL, whereas white Americans have a level of 26 ng/mL. Being overweight or obese may put you at risk for a vitamin D deficiency. A recent review of 23 studies showed that obese subjects had 35% higher rates of vitamin D deficiency compared with normal weight subjects and 24% higher rates compared with overweight subjects. While diet and decreased sun exposure may have some impact on this, there appears to be an increased need that cannot be met without a supplement. One study tested the blood levels of vitamin D after sun exposure in both obese and non-obese subjects. Both saw an initial rise in vitamin D levels after similar exposures, but 24 hours later, there was 57% less vitamin D in the blood of the obese subjects. Both groups had a similar capacity of the skin to produce the vitamin. The difference was seen in the release of vitamin D from the skin into the circulation. You may look out your window and see the sun shining and think that you are safe from this deficiency, but that is not always the case. Even in sunny climates there is an increased prevalence of vitamin D deficiency. We have all heard about the dangers of skin cancer and the need for sunscreen to protect us from this disease. This knowledge and the preventive actions we take have significantly decreased our vitamin D levels. Sunscreen protects so well against UV-B rays that an SPF of 30 decreases vitamin D synthesis in the skin by more than 95%. On top of this, we tend to spend more time indoors. One study found that it took Caucasians exposure of more than 30% of their body every day in the summer to make the optimal amounts of vitamin D. Most adults work indoors and wear more clothing during the work week, which leaves only about 10%-15% of their body exposed to UV for short periods, so they cannot meet their vitamin D needs through the sun alone. Even if you do have some exposure to the sun, the total amount of vitamin D you can produce is affected by the season, time of day, ozone amount, latitude, and number of clouds in the sky. The important thing about using the sun for vitamin D production is to know that less is more. You are better off with short regular exposures to the sun rather than prolonged exposure for many reasons. The process is not as simple as the sun hitting your skin and vitamin D appearing in your blood. What actually happens is that vitamin D3 is first transformed by a process known as hydroxylation in the liver to 25-hydroxyvitamin D3, often written as (25(OH)D3), and then again in the kidney to its active form, 1,25-dihydroxyvitamin D3, written as (1,25(OH)2D3). The level that is checked in your blood is 25-hydroxyvitamin D, often written as 25(OH)D, which includes vitamin D2 and D3. By staying in the sun, you limit this process and can actually get less vitamin D. You also have a lower risk of burning and damaging your skin with short exposures. The National Cancer Council in Australia recently published a position paper on ways to minimize the risk of skin cancer while maintaining adequate vitamin D levels via exposure from the sun. Currently, one-third of the population there is deficient. Extended and deliberate sun exposure without any form of protection when the UV index is 3 or above is not recommended for anyone. When the UV index is below 3, sun protection is not recommended, and it is recommended that people be outdoors in the middle of the day with some skin uncovered on most days of the week. Being that the sun is the primary source of vitamin D, your exposure, or lack of it, will impact your risk for a deficiency. 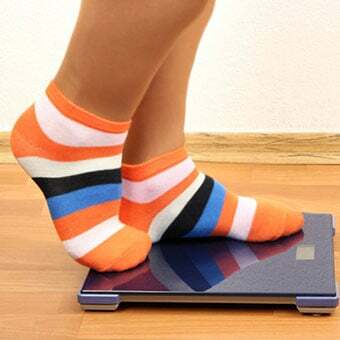 The Endocrine Society recommends screening and treatment for individuals at risk, including older adults with a history of falls or nontraumatic fractures; obese children and adults (BMI > 30 kg/m2); African-American and Hispanic children and adults; pregnant and lactating women; and people with musculoskeletal diseases, chronic kidney disease, hepatic failure, malabsorption syndromes, and some lymphomas. Ongoing monitoring is recommended for the elderly, people with disabilities, and hospitalized people as they have been shown to have a significantly higher risk. Research has begun to focus on who is deficient or insufficient in their vitamin D levels. Finding a deficiency does not mean that vitamin D is the cause of any ongoing symptoms. It simply means that there is a possible relationship, and more studies need to be done to clarify the relationship between vitamin D insufficiency or deficiency and disease processes. People with one of the fat malabsorption syndromes (for example, Crohn's disease or celiac disease) and people who have had bariatric surgery are often unable to absorb enough of the fat-soluble vitamin D.
Elderly: It has been shown that as we age our body has a decreased ability to synthesize vitamin D from exposure to the sun. There can be as much as 25% reduced production over the age of 70. While this can have an impact, it doesn't cause as much of a deficiency as the other risk factors. Children: A study done in Ethiopia found that schoolchildren between the ages of 11-18 years were more likely to be overweight or obese when they were deficient in vitamin D. Another study of 301 students aged 11-19 years found that 12% of the students were deficient, and 53% had insufficiency. It also found that as body weight increased (measured by BMI) the level of vitamin D decreased. A wide variety of medications, including antifungal medications, anticonvulsants, glucocorticoids, and medications to treat AIDS/HIV, can enhance the breakdown of vitamin D and lead to low levels. The largest meta-analysis ever conducted on all of the published studies between 1966 and 2013 regarding 25(OH)D levels and all-cause mortality found that the lowest mortality (death) risk is seen when the levels are >40 ng/mL. 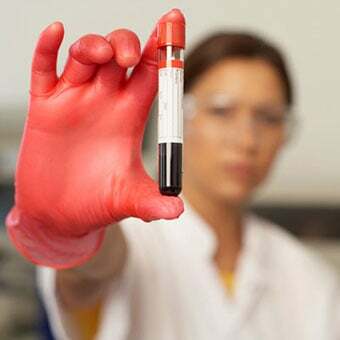 According to this, the IOM guidelines are too low and there is a plea calling on the public health authorities to change the recommendations for both the ideal blood level and the requirements needed to achieve this level. Your 25(OH)D level will change by seasons if you vary how much time you spend in the sun each season. Keep this in mind when scheduling your test. The amount of vitamin D that is needed to correct a deficiency will depend on the severity of the deficiency and your individual medical conditions. The time of year will also impact your needs. For example, if you are on the low end of adequate blood levels and heading in to the winter months you would need a bit more than if you were heading in to the summer months if you spend time out in the sun. The goal for everyone is to get your stores to a safe level and prevent them from dropping with a maintenance plan. What you take is as important as how you take it. Vitamin D supplements should be taken with a meal that contains fat. Studies have shown that when taken on an empty stomach versus with a meal containing fat, there was an average of 32% more vitamin D absorption in the fat-containing meal. This ranged from 11%-52%. Even an 11% reduction is significant and can impact your vitamin level. A recent study instructed people to take their supplement with their largest meal (typically the one with the most fat), and in three months, their blood levels went up an average of 56.7%. There are supplements that can be taken on a daily, weekly, or monthly basis. It's a matter of preference and, most importantly, which one you will be more likely to take. When you are deficient, it is recommended to have your blood tested after two to three months of taking the supplement to be sure that your levels are going up. Work with your doctors to find the optimal plan for you. For children 1-18 years of age who are vitamin D deficient, we suggest treatment with 2,000 IU/d of vitamin D3 for at least six weeks or with 50,000 IU once a week for at least six weeks to achieve a blood level of 25(OH)D above 30 ng/mL, followed by maintenance therapy of 600-1,000 IU/day. We suggest that all adults who are vitamin D deficient be treated with 50,000 IU of vitamin D3 once a week for eight weeks or its equivalent of 6,000 IU of vitamin D3 daily to achieve a blood level of 25(OH)D above 30 ng/mL, followed by maintenance therapy of 1,500-2,000 IU/day. In obese patients, patients with malabsorption syndromes, and patients on medications affecting vitamin D metabolism, we suggest a higher dose (two to three times higher; at least 6,000-10,000 IU/day) of vitamin D to treat vitamin D deficiency to maintain a 25(OH)D level above 30 ng/mL, followed by maintenance therapy of 3,000-6,000IU/day. One study found that for every 33 lbs. of body weight the serum 25(OH)D level was 4 ng/mL lower at the end of one year of monitoring. This could lead to a significant change in the amount required to supplement based on your body weight and starting serum level. African-Americans: The population mean serum 25(OH)D level has been shown to be lower in African-Americans than whites, but supplementation has been shown to be as effective in this population. A few foods naturally contain vitamin D, and other foods are fortified with it. With only 20% of our vitamin D intake expected from food, exposure to the sun and taking supplements remain the primary sources. Follow your health care provider's recommendations for supplementing on a regular basis, get some sun exposure, consume foods that contain vitamin D, have regular blood work to monitor your level, and make adjustments to your intake based on your medical needs and seasonal changes. There have never been warnings about getting too much vitamin D from the sun so many do not realize that there is such a thing as too much vitamin D. There are negative health consequences from too much vitamin D, but this can only happen with excessive doses of supplements. A Tolerable Upper Limit (UL) has been set to avoid any issues, but there is some controversy about how much is too much. A blood level above 150 ng/mL appears to be the point at which problems occur, but some suggest that levels above 120 ng/mL should be the cap. Potential problems are hypercalcemia (elevated calcium in the blood, causing weakness, confusion, constipation, loss of appetite and painful calcium deposits), hypercalciuria (excess calcium in the urine), and hyperphosphatemia (elevated phosphate levels in the blood). Over the long term, the elevated blood levels of calcium can lead to vascular and tissue calcification, with subsequent damage to the heart, blood vessels, and kidneys. Research has shown that very high doses of vitamin D can actually increase the risk of falls and fractures. A study of 2,256 community-dwelling women, aged 70 years or older, found that over five years those given very high doses of vitamin D experienced 15% more falls and 26% more fractures than those in the placebo group. The arguments against these upper limit levels stem from the fact that you can get 10,000-25,000 IU from exposure to the sun in one day. The IOM states that excessive sun exposure does not result in vitamin D toxicity because the sustained heat on the skin is thought to photodegrade vitamin D3 as it is being formed. Studies have shown that long-term supplementation over 10,000 IU/day can cause kidney and tissue damage, but this would only occur over a long period of time. One study reports that you would need to consume 50,000 IU/day over several months to reach toxicity blood levels. A recent study found that high-dose vitamin D supplementation (20,000-40,000 IU/week) caused a slight but significant increase in hemoglobin A1C and C-reactive protein, and a decrease in serum HDL ("good" cholesterol). The best way to avoid any issues is to take appropriate levels to correct a deficiency or insufficiency and have your blood checked after a few months and then decrease to maintenance levels once you have reached the correct level. There is no disputing the fact that vitamin D plays many crucial roles in our well-being, and many of us have either deficient or inefficient blood levels. An affordable, convenient way to test vitamin D levels, similar to finger-sticks used for blood sugar testing, can play a vital role correcting low blood levels. Changes to our lifestyle, diet, and regular supplementation are the keys to curbing the vitamin D deficiency pandemic. Ali, A., et al. "Developmental Vitamin D Deficiency and Autism: Putative Pathogenic Mechanisms." J Steroid Biochem Mol Biol 175 Jan. 2018: 108-118. Allan, G.M., et al. "Vitamin D: A Narrative Review Examining the Evidence for Ten Beliefs." J Gen Intern Med Mar. 7, 2016. Anglin, R.E. "Vitamin D Deficiency and Depression in Adults: Systematic Review and Meta-analysis." Br J Psychiatry 202 Feb. 2013: 100-7. Annweiler, C. "Vitamin D in Dementia Prevention." Ann N Y Acad Sci 1367.1 Mar. 2016: 57-63. Annweiler, C., et al. "'Vitamin D and Cognition in Older Adults': Updated International Recommendations." J Intern Med 277.1 Jan. 2015: 45-57. Banihashemi, Mahnaz, et al. "Serum Vitamin D3 Level in Patients With Female Pattern Hair Loss." Int J Trichology 8.3 July-Sept. 2016: 116-120. Bičíková M, et al. "Vitamin D in Anxiety and Affective Disorders." Physiol Res 2015;64 Suppl 2:S101-3. Bischoff-Ferrari, H.A., et al. "Monthly High-Dose Vitamin D Treatment for the Prevention of Functional Decline: A Randomized Clinical Trial." JAMA Intern Med 176.2 Feb. 2016: 175-183. Bouillon, R., et al. "Optimal Vitamin D Status: A Critical Analysis on the Basis of Evidence-Based Medicine." J Clin Endocrinol Metab 98.8 Aug. 2013: E1283-304. de Oliveira, C., et al. "Associations Between Vitamin D Levels and Depressive Symptoms in Later Life: Evidence From the English Longitudinal Study of Ageing (ELSA)." J Gerontol A Biol Sci Med Sci 22 June 2017. Deda, L., et al. "Improvements in Peripheral Vascular Function With Vitamin D Treatment in Deficient Adolescents With Type 1 Diabetes." Pediatr Diabetes 23 Oct. 2017. Douros, K., et al. "Asthma and Allergy 'Epidemic' and the Role of Vitamin D Deficiency." Adv Exp Med Biol 996 (2017): 169-183. Gallagher, J.C., et al. "Vitamin D Supplementation in Young White and African American Women." J Bone Miner Res 29.1 Jan. 2014: 173-81. Garland, C.F., et al. "Meta-analysis of All-Cause Mortality According to Serum 25-Hydroxyvitamin D." Am J Public Health 104.8 Aug. 2014: e43-50. Ginde, Adit A., et al. "Demographic Differences and Trends of Vitamin D Insufficiency in the US Population, 1988-2004." Arch Intern Med 169.6 Mar. 23, 2009: 626-632. Goodwill, A.M., et al. "Vitamin D Status Is Associated With Executive Function a Decade Later: Data From the Women's Healthy Ageing Project." Maturitas 107 Jan. 2018: 56-62. Gregoriou, E., et al. "The Effects of Vitamin D Supplementation in Newly Diagnosed Type 1 Diabetes Patients: Systematic Review of Randomized Controlled Trials." Rev Diabet Stud 14(2-3) Summer-Fall 2017: 260-268. Gunta, S.S. "The Effect of Vitamin D Status on Risk Factors for Cardiovascular Disease." Nat Rev Nephrol 10 Apr. 2013. Hassanalilou, T., et al. "Role of Vitamin D Deficiency in Systemic Lupus Erythematosus Incidence and Aggravation." Auto Immun Highlights 9.1 Dec. 26, 2017. Helde-Frankling, M., and L. Björkhem-Bergman. "Vitamin D in Pain Management." Int J Mol Sci 18.10 Oct. 18, 2017. Holick MF. "Vitamin D Deficiency." N Engl J Med 357 (2007): 266-281. Hossein-Nezhad, A., and M.F. Holick. "Vitamin D for Health: A Global Perspective." Mayo Clin Proc 88.7 July 2013::720-755. Hujoel, P.P. 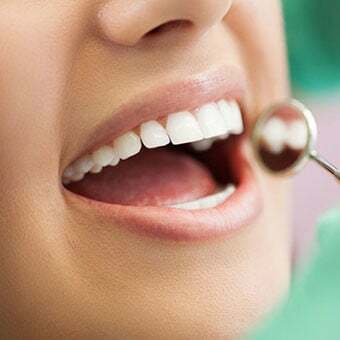 "Vitamin D and Dental Caries in Controlled Clinical Trials: Systematic Review and Meta-Analysis." Nutr Rev 71.2 Feb. 2013: 88-97. Institute of Medicine of the National Academies. "Dietary Reference Intakes for Calcium and Vitamin D." Nov. 30, 2010. .
Jat, K.R. "Vitamin D Deficiency and Lower Respiratory Tract Infections in Children: A Systematic Review and Meta-Analysis of Observational Studies." Trop Doct 47.1 Jan. 2017: 77-84. Jesus, C.A., et al. "The Role of Vitamin D in Pathophysiology and Treatment of Fibromyalgia." Curr Pain Headache Rep 17.8 Aug. 2013: 355. Jorde, R. "Supplementation With High Doses of Vitamin D to Subjects Without Vitamin D Deficiency May Have Negative Effects: Pooled Data From Four Intervention Trials in Tromsø." ISRN Endocrinol 348705 Mar. 2013. Lapid, M.I. "Vitamin D and Depression in Geriatric Primary Care Patients." Clin Interv Aging 8 May 2013: 509-14. Laslett, L.L. "Moderate Vitamin D Deficiency Is Associated With Changes in Knee and Hip Pain in Older Adults: A 5-Year Longitudinal Study." Ann Rheum Dis Apr. 2013. Lee, Y.H., and S.C. Bae. "Vitamin D Level in Rheumatoid Arthritis and Its Correlation With the Disease Activity: A Meta-Analysis." Clin Exp Rheumatol 34.5 Sept.-Oct. 2016: 827-833. Lee, Y.H., and S.C. Bae. "Vitamin D Level in Rheumatoid Arthritis and Its Correlation With the Disease Activity: A Meta-Analysis." Clin Exp Rheumatol Apr. 6, 2016. Liu, Y., et al. "Vitamin D: Preventive and Therapeutic Potential in Parkinson's Disease." Curr Drug Metab 14.9 Nov. 2013: 989-93. Maddock, J., et al. "Vitamin D and Common Mental Disorders in Mid-life: Cross-sectional and Prospective Findings." Clin Nutr 32.5 Oct. 2013: 758-764. McCarty, D.E. "Nonspecific Pain Is a Marker for Hypovitaminosis D in Patients Undergoing Evaluation for Sleep Disorders: A Pilot Study." Nat Sci Sleep 5 Mar. 2013: 37-42. Mahto, H., et al. "Association Between Vitamin D Receptor Polymorphisms and Systemic Lupus Erythematosus in an Indian Cohort." Int J Rheum Dis 12 Dec. 2017. Marwaha, R.K., et al. "Role of Parathyroid Hormone in Determination of Fat Mass in Patients with Vitamin D Deficiency." Indian J Endocrinol Metab 21.6 Nov.-Dec. 2017: 848-853. Nsengiyumva, V., et al. "The Association of Circulating 25-Hydroxyvitamin D Concentration With Peripheral Arterial Disease: A Meta-Analysis of Observational Studies." Atherosclerosis 243.2 Dec. 2015: 645-651. O'Sullivan, M. "Vitamin D as a Novel Therapy in Inflammatory Bowel Disease: New Hope or False Dawn?" Proc Nutr Soc 74.1 Feb. 2015: 5-12. Papadimitriou, D.T. "The Big Vitamin D Mistake." J Prev Med Public Health 50.4 July 2017: 278-281. Pereira-Santos, M., et al. "Obesity and Vitamin D Deficiency: A Systematic Review and Meta-Analysis." Obes Rev 16.4 Apr. 2015: 341-349. Peterson, L.A., et al. "Vitamin D Status and Supplementation Before and After Bariatric Surgery: A Comprehensive Literature Review." Surg Obes Relat Dis Jan. 6, 2016. Qin, L.L., et al. "Does Maternal Vitamin D Deficiency Increase the Risk of Preterm Birth: A Meta-Analysis of Observational Studies." Nutrients 8.5 May 20, 2016. Sadeghian, M., et al. "Vitamin D Status in Relation to Crohn's Disease: Meta-Analysis of Observational Studies." Nutrition 32.5 May 2016: 505-514. Sharma, S., et al. "Does Vitamin D Supplementation Improve Glycaemic Control in Children With Type 1 Diabetes Mellitus? A Randomized Controlled Trial." J Clin Diagn Res 11.9 Sept. 2017. Sintzel, M.B., et al. "Vitamin D and Multiple Sclerosis: A Comprehensive Review." Neurol Ther 14 Dec. 2017. Spedding, S. "Vitamin D and Depression: A Systematic Review and Meta-Analysis Comparing Studies With and Without Biological Flaws." Nutrients 6.4 Apr. 11, 2014: 1501-1518. Tsuprykov, O., et al. "Why Should We Measure Free 25(OH) Vitamin D?" J Steroid Biochem Mol Biol 4 Dec. 2017. Vanlint, S. "Vitamin D and Obesity." Nutrients 5.3 Mar. 2013: 949-56. Wakayo, T., et al. "Vitamin D Deficiency Is Associated With Overweight and/or Obesity Among Schoolchildren in Central Ethiopia: A Cross-Sectional Study." Nutrients 8.4 Apr. 1, 2016. Whiting, S.J., et al. "Moderate Amounts of Vitamin D3 in Supplements are Effective in Raising Serum 25-Hydroxyvitamin D from Low Baseline Levels in Adults: A Systematic Review." Nutrients 7.4 Apr. 1, 2015: 2311-2323. Valipour, G., et al. "Serum Vitamin D Levels in Relation to Schizophrenia: A Systematic Review and Meta-Analysis of Observational Studies." J Clin Endocrinol Metab 99.10 Oct. 2014: 3863-3872. Wang, J., et al. "Meta-Analysis of the Association Between Vitamin D and Autoimmune Thyroid Disease." Nutrients 7.4 Apr. 3, 2015: 2485-2498. Wei, S.Q., et al. "Maternal Vitamin D Status and Adverse Pregnancy Outcomes: A Systematic Review and Meta-Analysis." J Matern Fetal Neonatal Med 26.9 June 2013: 889-899. Wimalawansa, S.J. "Associations of Vitamin D With Insulin Resistance, Obesity, Type 2 Diabetes, and Metabolic Syndrome." J Steroid Biochem Mol Biol Jan. 2018. Xu, M.Y., et al. "Vitamin D and Graves' Disease: A Meta-Analysis Update." Nutrients 7.5 May 21, 2015: 3813-3827. Zhang, J., et al. "Relationship Between Vitamin D Deficiency and Diabetic Retinopathy: A Meta-Analysis." Can J Ophthalmol 52 Suppl 1 Nov. 2017: S39-S44. Zhou, J., et al. "Association of Vitamin D Deficiency and Frailty: A Systematic Review and Meta-Analysis." Maturitas 94 Dec. 2016: 70-76. What were your symptoms associated with a diagnosis of vitamin D deficiency? If known, what were the causes of your vitamin D deficiency? What were your reasons for getting tested for a vitamin D deficiency? What is the treatment for your vitamin D deficiency?